According to AdDuplex, a Lithuanian company whose technology is embedded in thousands of Windows Store apps, Windows 10 October 2018 Update - 1809 in Microsoft's yymm labeling format - powered just 21% of surveyed Windows 10 systems as of Feb. 25. 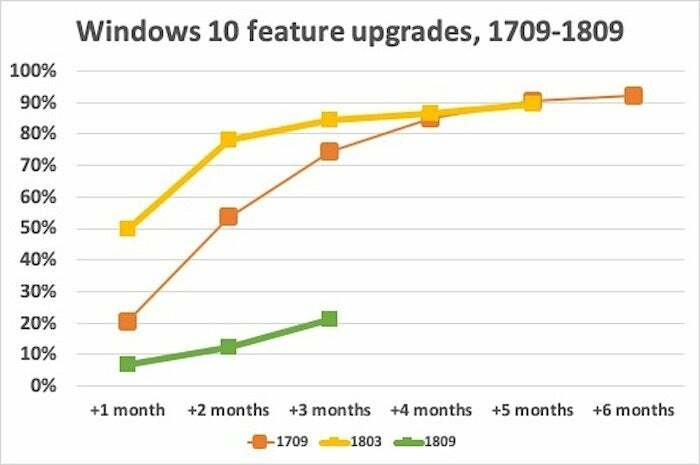 That percentage was less than a fourth of the 85% running 1709 - Windows 10's second feature upgrade of 2017, and the closest comparison for 1809 - at the same time in its timeline. Because Microsoft demands that users of Windows 10 Home download and install feature upgrades as soon as they're offered, the Windows 10 update regimen is on a tight six-month schedule. With 1809's automated distribution starting three months late, 1903 will be hard on its heels. It's as if the 1809 release train was late out of the station and the follow-up 1903 couldn't be kept waiting and so rolled out on time. The result: A likely rear-end collision. None of this should matter to organizations running Windows 10 Enterprise: They're given 30 months of support for 1809, so they can deploy and run it for a considerable stretch before being obligated to upgrade to a future build. 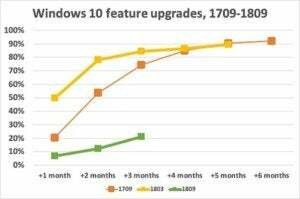 And Windows 10 Pro users are able to defer feature upgrades for up to 365 days, giving them time to run one version before having to switch to another. For example, Windows 10 Pro users could install 1809 next month, defer further upgrades for, say, 180 days, then pick up Windows 10 Pro 1909 before 1809's end-of-support deadline of Nov. 12. Only Windows 10 Home lacks such flexibility. But that may be changing. Some news outlets last week reported that Windows 10 Home 1903 may sport an option that would let users pause updates for up to 35 days. 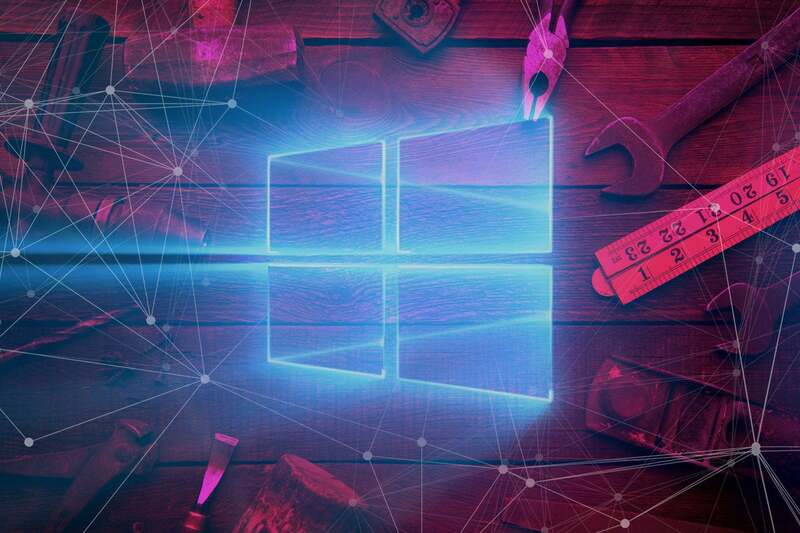 Although that option, if it reaches Windows 10 Home, would be better suited for avoiding problematic monthly updates until Microsoft quashed all the bugs, it should also allow users to delay the installation of a feature upgrade for a limited time. This story, "When Windows 10 feature upgrades collide" was originally published by Computerworld.